Fundraiser for Darla Romero by Brigette Hamilton Hubert : Help Darla Fight this Battle! 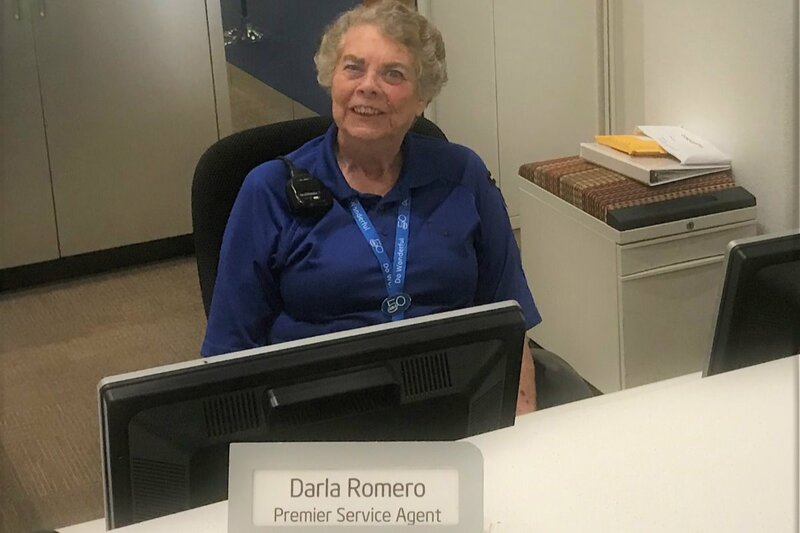 Darla Romero is one of our amazing Security Officers at Intel and the employees love seeing her smiling face when we enter the building each morning. Darla was recently diagnosed with brain, lung, and bone cancer and will have mounting medical costs as she undergoes extensive treatment (radiation, chemo, etc), even with insurance. She is a woman of strong faith with a great attitude and ready to face the fight, and we don't want her to stress over the financial side of it. Please give generously and show Darla your support and love as she enters this fight! Darla Romero went home to be with the Lord March 18, 2019. She was born on October 28, 1946 to John & Augusta Carpenter and was the youngest of 8 children. Darla loved her family and will be sorely missed. She enjoyed traveling but especially liked to spend time camping with her friends in Vallecito, Co., was an avid reader, a Lobo fan and loyal Cowboys fan. She worked at the front desk at Intel where she was able to greet and share a smile with so many of her friends. She is preceded in death by her parents and her husband, Joe Romero. She is survived by her son David Romero and his wife Angelica, her daughter Robin Brown, grandson Joshua Romero and wife DeAmbra, granddaughter Mercedez Hernandez, great grandson Joshua, great-granddaughter DeAmbra, sisters Barbara Rockefeller, Charlene Hill, Shirley Hooven, JoAnn Riley, MJ Carpenter, brother Norman Carpenter and wife Betty, brother John Carpenter and wife Erma and numerous nieces and nephews as well as lifelong friends and the new friends that cared for her at Senior Care NM and her Silver Linings hospice nurse Samantha. Services will be held at Albuquerque Bible Church, 320 Montano Rd NW, Alb. Monday March 25 with viewing from 10-11 and service at 11:00. Direct Funeral Services is handling the arrangements. I wanted to share the e-mail AJ (Darla's nephew) sent out... "It is with a heavy heart that I share the passing of Darla Romero. I will share the details of the funeral services when they are finalized. My family really appreciates all of the prayers, flowers, visits and cards. Your kindness and friendships brought her a lot of joy in her last days. I have an update on Darla from her family. She is no longer receiving treatment for her cancer and is now on hospice. The family’s main goal is to keep her comfortable. This past week we moved her to a new place that will provide her better hospice care. Let's all send her cards and let her know we are keeping her in our thoughts and prayers! Here is the address: Senior Care Mountain House, 5020 Mountain Rd NE, Abq, NM 87110. Hello friends of Darla! I spoke with Darla a little over a week ago and wanted to give an update. First of all, she wanted me to tell you all that she is "NOT dying and is fighting the fight!" :-) She is very weak right now and has lost a lot of weight from nausea and not being able to eat or keep anything down from the chemo pill and shot. She is choosing to not do the shot again in hopes she will be able to eat and get that nourishment her body needs for this fight. Please keep her in your thoughts and prayers...she so appreciates those! Also, please consider spreading the news about this fund while people are being generous during the holiday season. Darla could really use the financial help while she is unable to work. Thank you all for your generous and giving hearts!